Wake to a beautiful you, thanks to this sleep cap’s smooth-as-satin lining that preserves your hairstyle! 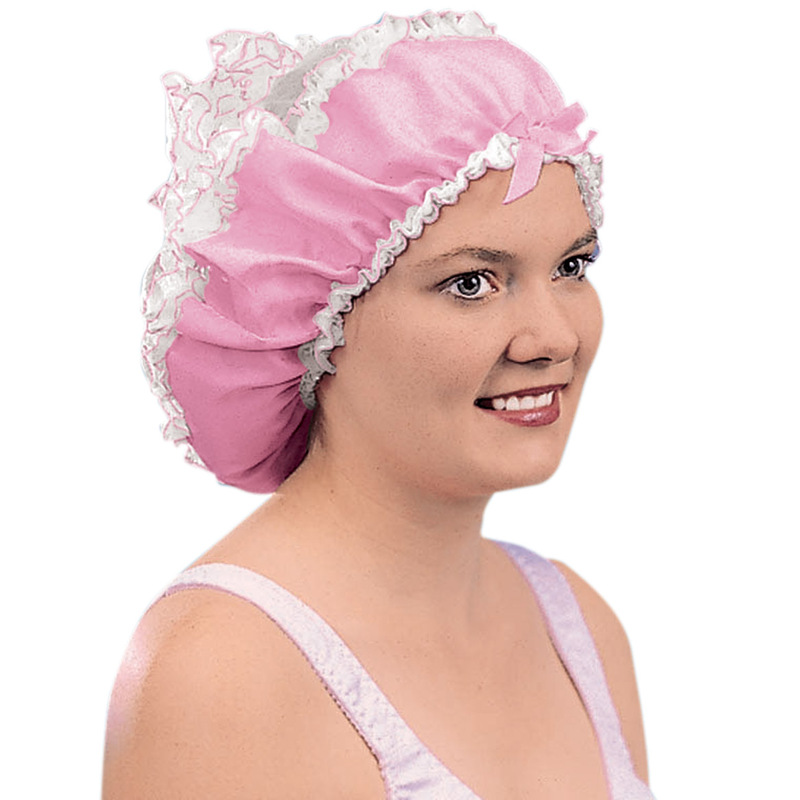 Sleeping cap is ultra comfy, with non-binding elastic edge; adjusts to accommodate any hairstyle. Polyester; machine wash. Imported. 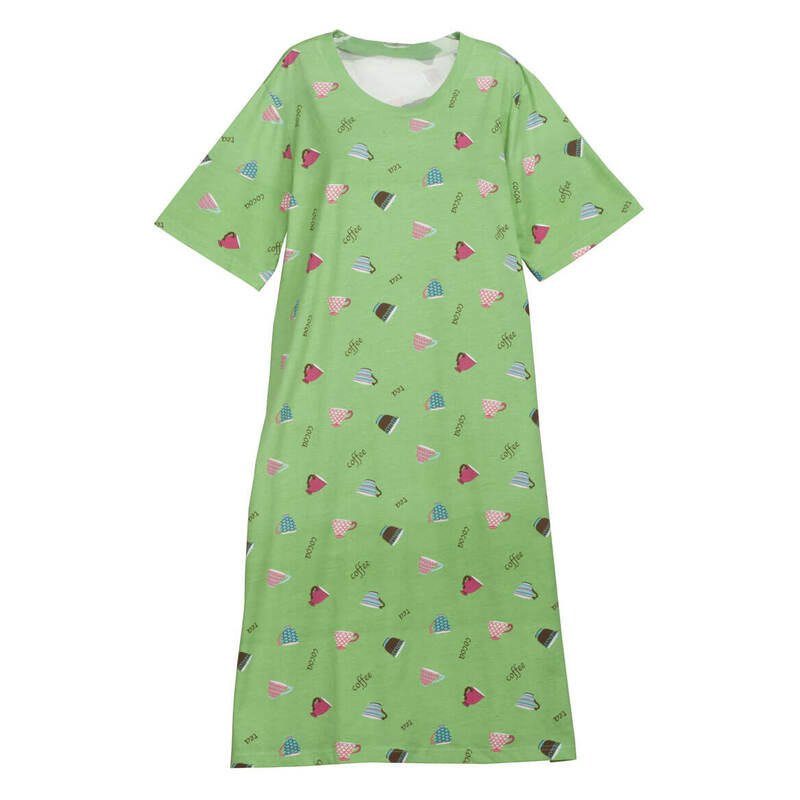 Longer than your favorite T-shirt, this Coffee Print nightshirt surrounds you in sweet-dream comfort … then works the day shift beautifully for luxurious lounging. Featuring a fun coffee-cup print in a soft jersey knit, our sleep shirt’s relaxed, generous cut won’t bind or confine. Designed with a classic crew neck and short sleeves, it hits about mid-thigh, measuring approx. 45″ long. Specify size: medium (12-14), large (16-18) or XL (20-22). 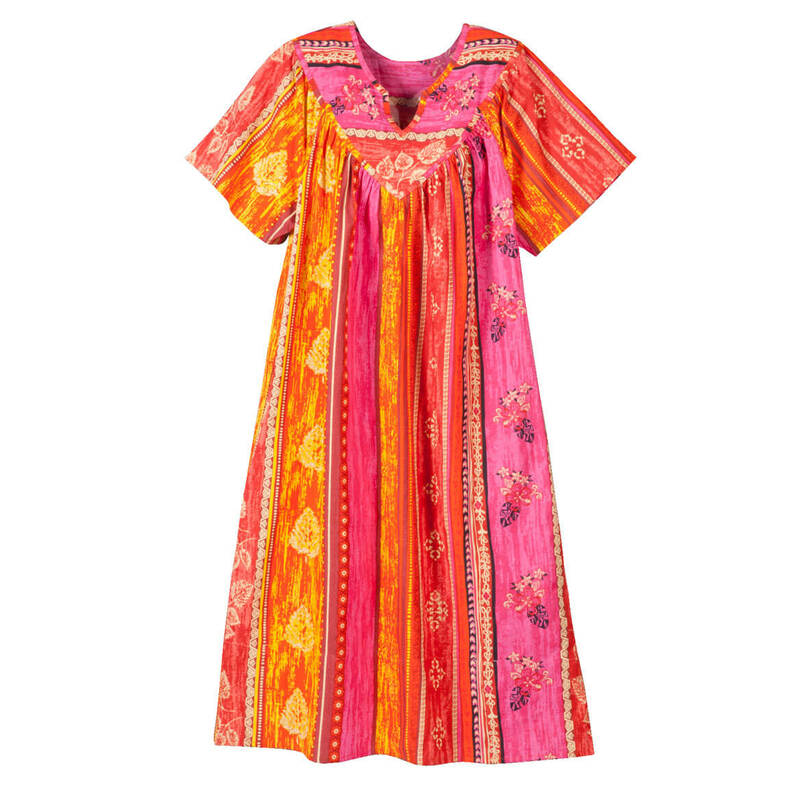 Women’s nightshirt made with 60% cotton/40% polyester; machine wash. Imported. Lounging is a breeze in this sleeveless snap front lounger woven of soft, breathable 100% cotton. Featuring an easy, unrestricted fit and full snap front for effortless on/off, the lightweight lounge dress is perfect for relaxing at home, and pretty enough for entertaining guests. The gorgeous floral print comes in two flattering colors. Specify color: purple or cobalt. Specify size: medium, large, XL, 1XL, 2XL or 3XL. Approx. length: medium-44″; large-445/8″; X-large, 1X, 2X and 3X-45″. Machine wash. Imported. Warm, cozy and wonderfully light … our plush chenille-like fleece bed jacket is the perfect solution when a bulky bathrobe is too much, but a flimsy shawl leaves you chilled. Offering perfect coverage for reading in bed, lounging on the sofa or stepping out for the morning paper, the button-front ladies bed jacket features long sleeves and two patch pockets, plus a warm folding collar. 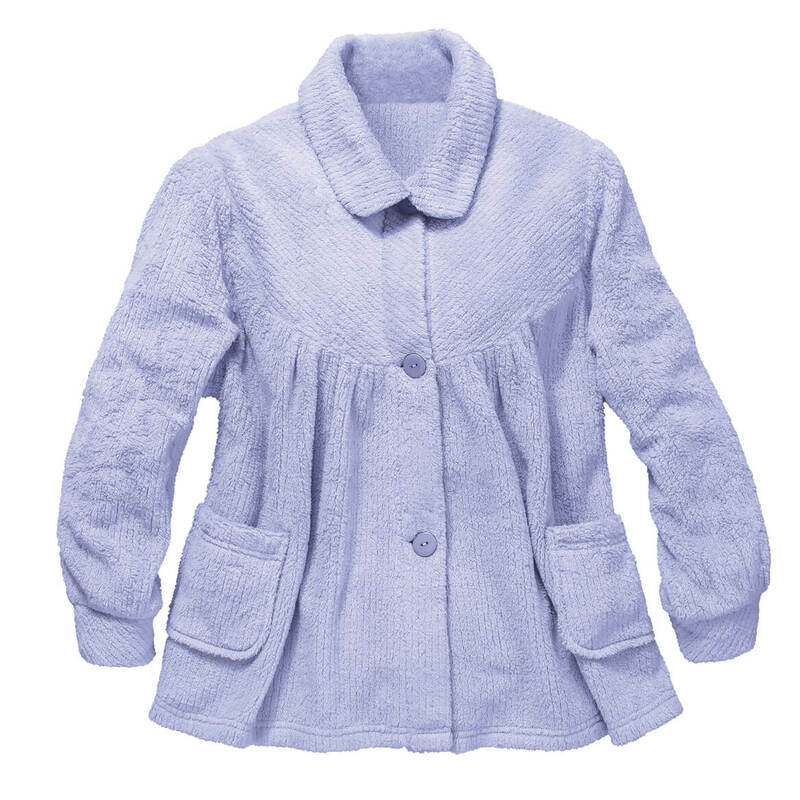 In ultra-soft tufted fleece, it’s incredibly comfy and pretty, in a soft shade of lavender. Medium: 24″ long; large: 24 1/2″ long; XL-1X: 25″ long, 2X: 251/2″ long; 3X: 26″ long. 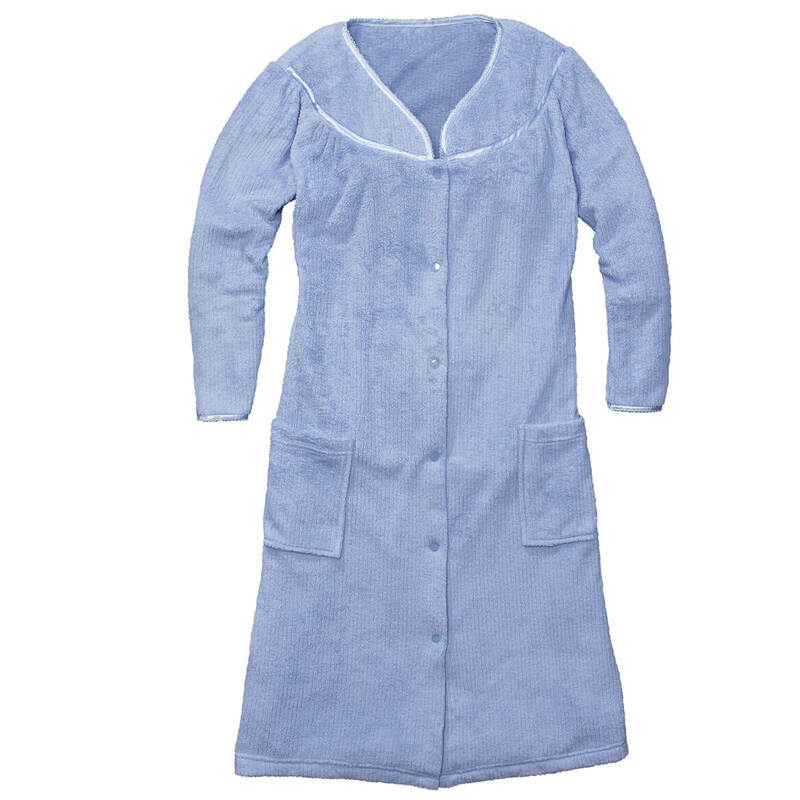 Women’s bed jacket made with 100% polyester; machine wash cold. Imported. Because you deserve a little luxury, this soft snap-front chenille-like fleece duster with pockets is elegant, ultra cozy and EASY … featuring full snap front for quick, simple dressing. Designed with two patch pockets, pretty rounded collar and subtle satin detailing at yoke and sleeves, the cozy duster coat is warm, yet wonderfully lightweight—flattering you in a lovely shade of lavender. Medium-XL: 42″ long, 1X-3X: 43″ long. Medium (10-12), Large (14-16), XL (18-20), 1X (22W-24W), 2XL (26W-28W), 3X (30W-32W). 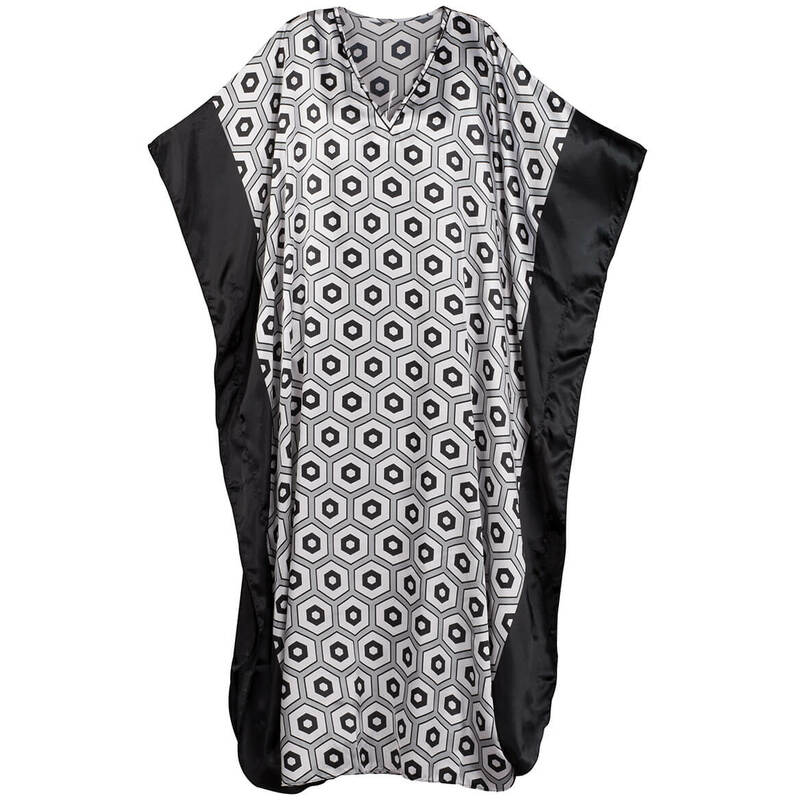 Duster jacket made with 100% polyester; machine wash cold. Imported. Cozier and CUTER than sweatpants or p.j.s, these lounge pants are soft, comfy and perfect on Christmas morning—in a festive reindeer print! 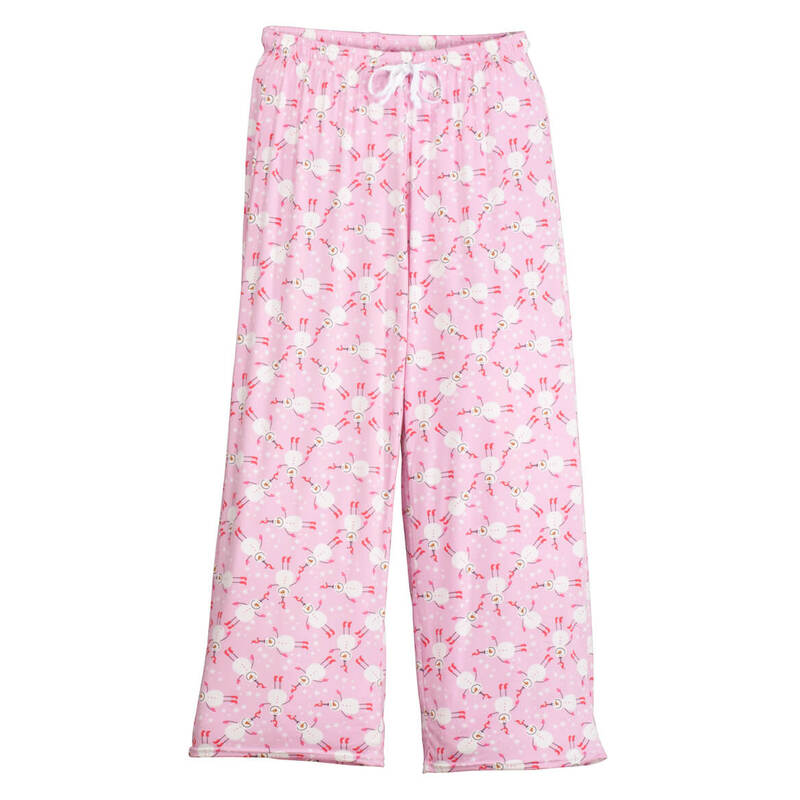 Pampering you in ultra-soft brushed 100% polyester, the easy-fitting Christmas pants feature a full elastic waist with functional drawstring, providing custom fit and ultimate comfort. An affordable luxury for you, and a gift anyone will love, the plush, packable elastic pants include a matching drawstring carrying bag. Specify size: M/L (fits 8-10) or L/XL (fits 12-16). Machine wash. Imported. Slip into this easy, breezy split V-neck mid-length dress and you’re ready in seconds—comfy enough for lounging, yet stylish enough for guests! 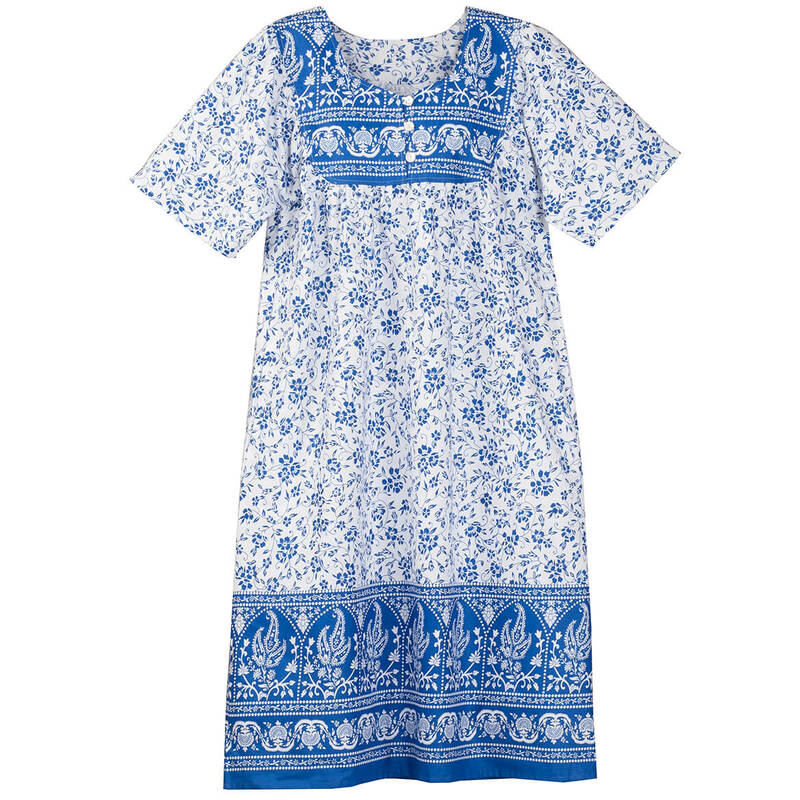 Woven of whisper-light 100% cotton in two beautiful prints, this cool, flattering pullover medium length dress has a modest V-neck and short sleeves for stylish upper arm coverage. Cotton dress comes finished with two convenient side pockets. Medium: 44″ long; large: 44 5/8″ long; XL-XXXL: 45″ long. Specify size: medium, large, XL, XXL or XXXL. 100% cotton; machine wash cold, tumble dry low. Imported. 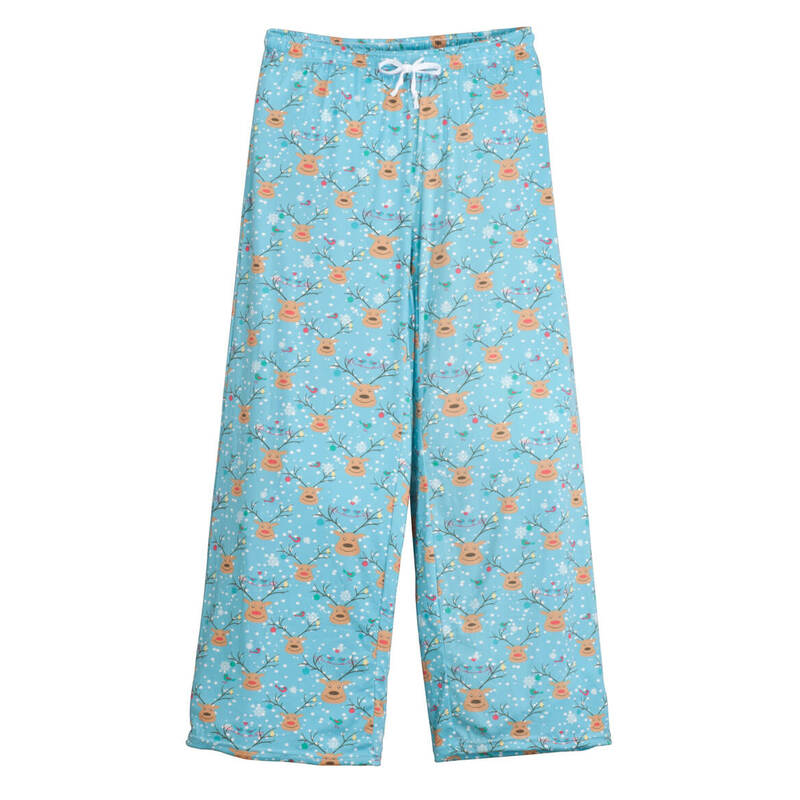 A cute, cozy alternative to sweats or p.j.s, these Snowman lounge pants offer lightweight warmth and comfy style in a fun snowman print. Designed in ultra-soft 100% polyester, the easy-fitting women’s loungewear feature a full elastic waist with functional drawstring, providing custom fit and live-in comfort. A gift anyone will love (including you! ), the plush, packable elastic pants include a matching drawstring carrying bag. Specify size: M/L (fits 8-10) or L/XL (fits 12-16). Machine wash. Imported. Flattering you with a stylish border print and the unrestricted fit you love, this Square Yoke Border Print Lounger offers feminine style and ultimate comfort. Designed in soft, breathable 100% cotton, its subtle, all-over blue pattern lends a charming touch, while square-yoke neckline with 3 buttons offers easy on/off dressing. Two side pockets provide added convenience. Specify size: medium, large, XL, XXL or XXXL or XXXXL. Machine wash and dry. Imported.